frozen Slushie machines, Video jukeboxes, Karaoke machines, Portable bars, Stainless steel spits, Mushroom outdoor heaters. 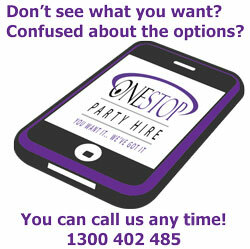 for your party, function, wedding, bucks night, hens night, birthday, anniversary, 21st, Christmas party, work party, street party, fete, school function, festival, product launch, engagement, celebration, house warming, farewell, divorce party, graduation or even a wake! Give us a call – we can also help with live entertainment!